An exercise in virtuosity, with undeniable intelligence, but with no particular relation to the history of philosophy….Can come back when he is prepared to accept the rules and not invent where he needs to be better informed. I decided that this text was a trap…that everything about it, in its form, was ambiguous, implied, convoluted, complicated, suggested, murmured….I deployed all my resources to uncover a range of meanings fanning out from each sentence, each word. 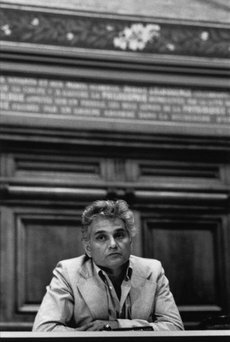 via Derrida: The Excluded Favorite by Emily Eakin | NYRblog | The New York Review of Books.